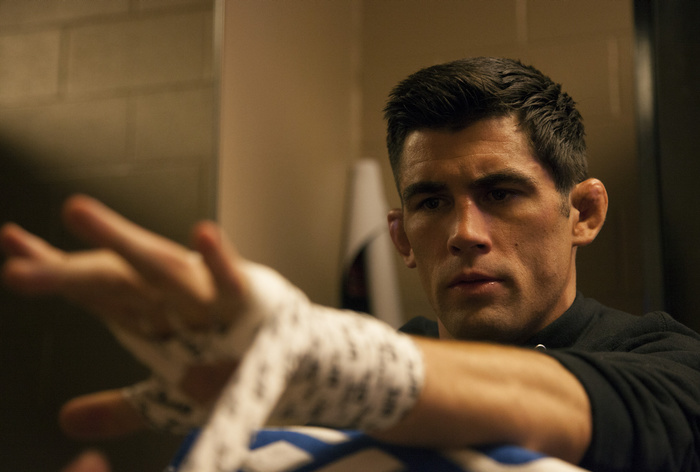 Dominick Cruz brings out extremes of opinion by merit of his incredible record, innovative style and lengthy absence. To some he's just too crafty, they could never see him losing, he's doing the calculations on angles you haven't even seen, inside his head before each exchange. To others he's an abomination, his feet are all over the place and he's going to pay for that when he fights a real opponent. Of course, there's a lot wrong with both views, and a little truth in both as well. Dominick Cruz does a lot which, if you go in for absolute textbook boxing or kickboxing, is wrong. But boxing has a strange way of not liking change. The same people who rattle off lists of all time greats which include Willie Pep—a man who was rarely in a set stance for more than a second or two at a time—will critique Cruz's footwork as erratic. Truth is, of course, that even the manly science of self defense ain't that scientific. There are only ideas, not fool proof methods. If textbook technique were all that, the guy with the longest, best jab in the world would win every fight by merit of that alone and never get hit in return. Every single thing you can do in the ring (spare perhaps closing your eyes) has costs and benefits to your performance. Genius lies in taking the disadvantages of a commonly disregarded method like switching stance or leading with a left uppercut, and mitigating the threats to the point that the advantages outweigh the dangers. The most obvious example of Dominick Cruz breaking a rule of thumb in striking is his constant switching of stances, and particularly his abandoning of stance directly in front of the opponent. Now the point of the stance in boxing is to provide a defensive base. The fighter in his stance is ready to defend and, more importantly, take blows. If a fighter eats a hard shot while he is between stances, he has a much higher chance of falling. The great example is, of course, T.J. Dillashaw versus John Dodson—Dillashaw was still conscious and working, but he got hit while off balance and never recovered. What Cruz's choice to constantly be moving in and out his stance does mean is that he provides no easy target. His lead leg is rarely in one spot to be kicked, his center of gravity and torso keep moving in and out of range. Opponents lunge at him and he's suddenly two feet further away than they expected. Absence of a stance has its disadvantages but does not necessarily mean an easy target. While a break with the common methodology of fighting, this is also something of a throwback. In the days of yore, shifting backwards or giving ground and stepping back into the opposite stance was a well known method of evasion. In the days of bareknuckle pugilism it would usually draw the disdain of the crowd (blocking was the only respectable means of avoiding punishment), but men like Daniel Mendoza man an art of it. More recently, the great flyweight boxer, Jimmy Wilde (variously praised as The Ghost with the Hammer in his Hand / The Mighty Atom / The Tylorstown Terror) insisted that his preferred evasion came from withdrawing the lead foot. An interesting opinion because when fighting from a stance, it is usually the back leg which controls retreating movements, even controlling how far the head may be pulled backwards. Here Cruz is fighting from a stance and moves his rear leg to facilitate a pull back from Scott Jorgensen's punches, then rocks back with a right hand into a combination. So many youngsters hurt themselves trying to lean back at the waist like Muhammad Ali without realizing that it's the back foot must always be behind the lean. What Cruz's constant stepping in and out of stance does is hide left high kicks and right straights excellently. Often he will perform the left high kick against the guard (almost all of his high kicks seem entirely in order to raise the opponent's guard more than to land), retract the foot, then step in again with the right hand. Step up to kick, plant the foot behind, leap forward with the side stepping right. 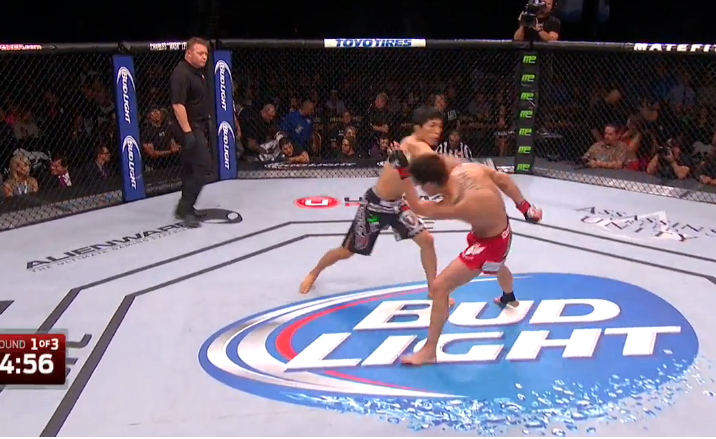 Here Cruz briefly drops Joseph Benavidez. The nature of Cruz's game, rarely performing this shuffling while being close enough to hit clean, and mixing it in with dozens of feints, mitigates the danger of abandoning stance. That being said, the mechanical downsides of not staying in a stance still apply to him. When he gets caught stepping back into his stance, he can be knocked off balance more easily than if he were to stay in a stance all the time. Here Cruz gets caught on one leg as he attempts to intercept Faber with a knee. But when you look deeper, Cruz has some of the finest boxing smarts in the game by any standard. While the stepping in and out of stance directly in front of the opponent deals entirely with the in and out, the fencing-like portion of the game, Cruz also excels in using lateral movement. I'm not talking about circling, circling, stopping, and then stepping in with punches, which is what passes for lateral movement for the most part in MMA. I'm talking about angling off after attacks and punishing opponents from the improved position. It's not revolutionary, this is stuff that everyone knows a fighter should be doing, but so few are. The simple act of cutting a tight angle to the opponent's side after an exchange often leaves a fighter in position to pick up easy strikes or begin another combination against an opponent who is turning. Notice how Cruz's quick skip across puts him into position to throw while Faber is still pivoting around his left foot and very much out of position to hit. That mythical idea of the triangle leap that we talked about with Roy Jones Jr. and T.J. Dillashaw. Cruz's use of side steps is particularly endearing. The classical side step, wherein one turns the whole body in the direction of the step, as if one is about to start sprinting in that direction, is one of the oldest and slickest techniques in the book. While it used to be used primarily as a defensive measure, as old fashioned jabbers wanted to steer clear of the infight, it has also been found to open up a great many offensive opportunities. Here Cruz uses changes of direction to escape the fence. If every fighter knew to do this, Roy Nelson wouldn't have so many knockouts on his record. And the more common classical side step to the rear side, cutting a deep angle and forcing a turn from Mizugaki. This buys Cruz time to punch and shoot in, again, while his man is chasing. But that side step to the left side opens up the body beautifully for right handed strikes allowing the head to fall off line and placing the right shoulder nearer to the opponent. Gentleman Jim Corbett's favorite was to throw a long right uppercut while performing a classical side step to the left (though back then they probably called it the 'new fangled side step'). A few attempted long rights combined with the side step against Jorgensen. A double right out of the side step. That same left high kick to right, followed by a side stepping right hook. One other interesting throwback feature of Cruz's game is his use of hooks while retreating. Long hooks which are more akin to swings, but hope to hurt the opponent as he chases. It reminds me somewhat of Phil Norman has been doing with his 'Ghost' system of striking. But my favorite Cruz moves on the retreat have to be the pivoting uppercuts. Cruz will go southpaw and pivot around the lead leg as he throws a right uppercut. He rarely lands them but the huge movement is certainly alarming for an opponents. Here he uses the uppercut to escape the fence in one direction, then reverses direction with a side stepping right straight to get out further in the other direction just as Jorgensen is moving to cut him off. Dominick Cruz is a fighter I am very cautious about getting excited for—his unfortunate history with injuries has left him with just one fight on his record since 2012. While I didn't want to overcommit and write a whole Dillashaw versus Cruz article before it was time, I have been sitting on my hands regarding Cruz for years and wanted to share at least a little of what I feel makes him so unique in the ring. Whether you think his style has its own flaws, or that he's a brilliant ring general, you're correct. There are upsides and downsides to everything, but so far Cruz has done an astounding job of making the most of the advantages of fighting uniquely, with a ton of brilliant textbook ringcraft layered on top.